Fire damage in Bakersfield is obviously very devastating. 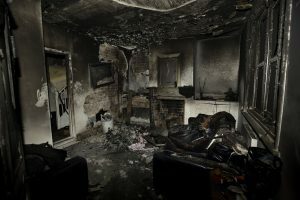 The havoc that it wreaks on your home can be clearly seen by any observer, however, there can be even more damage under the surface of the obvious burns and scorches you can see with the naked eye. Here are some examples of results of fire damage that could surprise you. When people think about the devastation that is caused by a fire, probably the last thing from their mind is water damage. However, water damage is a very real threat to homes that have experienced a fire and is more common than you’d think. Depending on the size of the fire, sometimes, if firefighters are on the scene, they will hack a hole through the roof to vent the fire. This means that the firefighters can see more clearly and it also reduces other risks for the first responders. So fixing the roof is definitely something that you would expect from fire damage, but you might not expect to have to deal with the water damage that comes from a big, gaping hole in your roof. Sometimes water damage is unavoidable, but you can reduce it if you have a fire damage company put a tarp over the hole while repairs are being done. Another thing that might surprise you is that mold loves to grow in homes where there has been fire damage. Mold needs a dark space, moisture, and food to survive and a home with fire damage hits the trifecta. Fire extinguishers leave behind a very messy aftermath of water that will seep into every last inch of the fire affected space. The heat, moisture from extinguishers, and newly decaying materials make your home a mold growth’s playground, and what’s worse, is that you can’t always get the water damage dealt with immediately, because the structure may not be safe. Mold growth is quick and messy, and a fire damage company that also specializes in water damage is definitely a company that you want to work with. Though this issue may not be a problem immediately, down the road, if your fire damage in Bakersfield is not restored by a professional from Alert Disaster, you may experience some termite problems. Termites love rotting or damaged wood, and if you do a quick patch job or you don’t dry the damaged area well enough, then you will risk termites making a home in your house. The best way to avoid having termites come into your house is to make sure that you have every bit of moisture dried out of the walls and flooring through thermal imaging. Water and fire damage companies have new technology that makes it easy to spot where the wet areas are even if they are dry to the touch. If the thermal technology can’t find moisture, then neither will the termites. Fire damage and water damage go hand in hand, and it is important to remember that if you have fire damage, then water damage is a given. It can be surprising that you will have to deal with moisture when you just had flames ravaging your home, but it is an issue that you will need professional help to rectify.